A couple of weeks ago in Crail, Fife on a sunny Saturday afternoon. The High Street is en fete as part of the excellent East Neuk Festival. 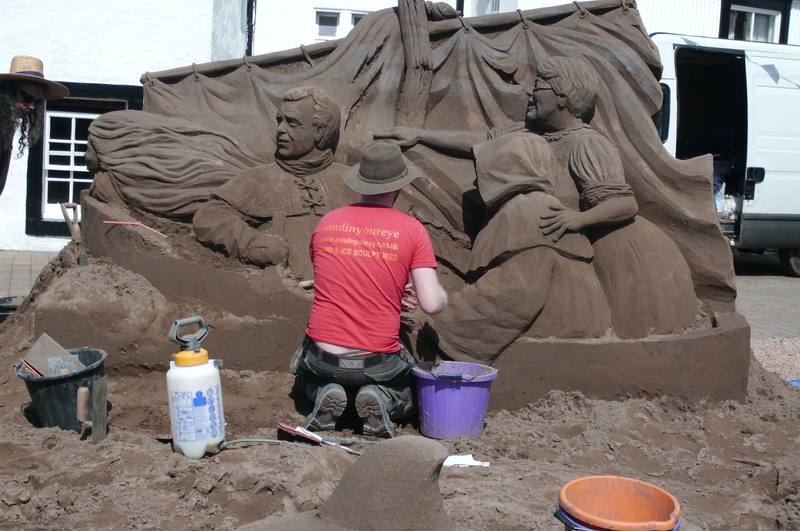 Just before the turn of the road north a large sand sculpture is being constructed by two professional sand sculptors. A middle class, middle aged male, probably English, in a pink shirt is explaining some detail to a young teenage girl, one of two with him, his daughters presumably. Ten/fifteen minutes later I am outside a fruit and veg shop that has made-up punnets of strawberries set up outside, £2 each. The Englishman and daughters arrive. One daughter selects a box of strawberries and starts adding more from other punnets to it, as well as removing one or two from the container she doesn’t like the look of. Father looks on approvingly. By the time she takes it inside to pay, the fruit is well above the level of the container’s rim and about a 1/3 – 1/2 greater in quantity than the remaining, now diminished containers. For some reason, this small vignette reminds me of the recent LIBOR furore. You have to feel sorry for the ScotRail employee responsible for their Twitter feed @ScotRail. Since 7 a.m. this morning (I write this at 8.45 a.m.) he/she has tweeted eleven times, seven in response to complaints made online. But the two tweets that caught my eye give information about changes to (no let’s speak plainly – problems with) a couple of train services this morning, useful in the circumstances I suppose, but not as useful as if they’d been able to run the trains as promised. Please be advised that the 08.39 Edinburgh/Fife Circle will run as 2 carriages due to set availability. Apologies for any inconvenience. Please be advised the 07:45 Falkirk Grahamston – Glasgow Qn St will run as 3 carriages due to unit availability. I bring these tweets to your avid attention as a small example of official (I suppose a privatised train company running services with a public subsidy can count as official) use of language. Note that one train has carriages, a concept I am familiar with, the other has sets, something I’m less clear about although I had one when I was a child. Note that one set (oops, sorry lot) of passengers get an apology (lucky old Fife circlers), the others from sunny Falkirk just get the information sans apology. Well, I suppose this is trivia, and at least any passengers on these lines who follow @ScotRail know where they stand – probably literally given their shrunken trains. The slightly bigger question is where do these carriages and ‘sets’ go? Have they wandered south to bail out First rail franchises in England? Are they lost in a siding somewhere? Did the crew set off without checking the coupling, leaving their respective carriages and sets, Thomas the Tank Engine-like, sobbing on lonely platforms at Falkirk Grahamstown and Edinburgh Waverley? Or are they just broke, and if so how and why? I think we, or at least the poor old commuters involved, should be told. Best of all, of course, do something to make sure your trains run as promised. Please be advised the 07:20 Dundee – Edinburgh will run as 4 carriages due to availability. Difficult to know what this adds to yesterday’s moan, except that ScotRail clearly suffer the disadvantage of not reading and taking note of the HelpGov blog. I might dip into this more regularly (at least offline, you’ll be pleased to know) to see whether they continue to lose carriages. What’s the betting that six months from now I’ll be able to update this post but with new examples?